The classic French baked scallops dish, Coquilles Saint Jacques. Photo courtesy CBCrabcakes.com. CAPSULE REPORT: One of our favorite party recipes, when we first began to master the art of French cooking, was Coquilles Saint Jacques (pronounced co-KEE saahn ZHAHK and often abbreviated as Coquilles St. Jacques). 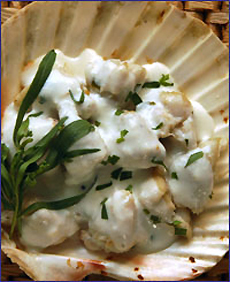 We loved scallops, cream sauce and grated cheese; and filling scallop shells meant a festive occasion. Make this dish for a weekend dinner or special occasion. It’s worth investing in the scallop shells—you’ll find other uses for them. Perhaps the most famous baked scallop dish is Coquilles Saint-Jacques, translated as Saint James’s scallops, a rich mixture of butter, cream, mushrooms and Parmesan cheese, baked in a scallop shell. The scallop shell is the emblem of Saint James the Greater. 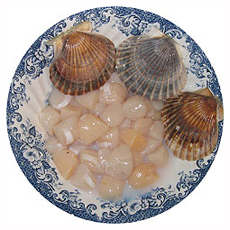 The saint’s association with the scallop shell is based on a legend that he once rescued a knight covered in scallops; a variation on the tale is that, while his remains were being transported to Spain from Jerusalem, the horse of a knight fell into the water and emerged covered in scallop shells. As a result, Medieval Christians making the pilgrimage to the shrine of Saint James in Santiago de Compostela, Spain, often wore a scallop shell symbol on their clothing. And so, this delicious dish in a wine-flavored cream sauce is served in a scallop shell and named after Saint Jacques. 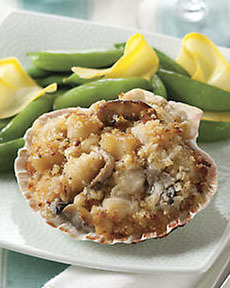 Consider serving it on March 12, National Baked Scallops Day; and on May 16th, National Coquilles Saint Jacques Day. You can buy the scallop shells in any cookware store (including chain stores), and they’re useful for serving other foods, from hors d’oeuvres (olives, for example) to desserts. Of course, you can serve the recipe on any plate—scallop shells are not required! Raw bay scallops and shells. Photo courtesy GliddensIslandSeafood.com. Also try Crabe En Coquille, crab in a cream sauce with Cognac, also served in coquille shells. This recipe is adapted from Mastering The Art Of French Cooking by Julia Childs, Louisette Bertholle and Simone Beck. Serves 6. We prefer it with the added tarragon. 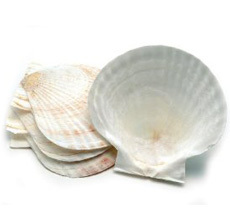 You’ll find numerous uses for these coquille shells—also called baking shells. You can purchase them at cookware stores or from Amazon. COOK the butter and flour slowly for two minutes in a separate saucepan. REMOVE from the heat; add the cooking liquid and blend. Then add the milk, stirring to blend into a smooth sauce. Return to heat and boil for one minute. BEAT the sauce from the pan into the egg yolk mixture, by driblets. Return to pan and boil, stirring, for 1 minute. Thin with cream if necessary. Season to taste with salt, pepper and a few drops of lemon juice. Strain. BLEND 2/3 of the sauce with the scallops and mushrooms. SET the scallops 8 to 9 inches beneath a moderately hot broiler to heat through gradually, and to brown the top of the sauce. Serve immediately. Serve with Chardonnay or white Burgundy. Rice with herbs and fresh peas and a seasonal green vegetables add a nice counterpoint—and some color—to the plate. Add a tablespoon of brandy or sherry during Step 6. Anything looks pretty in a scallop shell—especially scallops! In this gluten-free version,the breadcrumbs are replaced by snipped tarragon. Photo courtesy Miller’s Seafood. *Velouté Sauce: Velouté sauce is one of the four “mother sauces” of French cuisine, designated by the great chef Marie-Antoine Carême in the early 19th century. The others were allemande, béchamel and espagnole sauce; Auguste Escoffier would later elevate hollandaise, mayonnaise and tomato sauce to mother sauce level. Velouté means “velvety” in French. The sauce is made from stock thickened with roux (equal parts of butter and flour), salt and pepper. In this recipe, the “stock” comes from cooking the scallops and mushrooms.